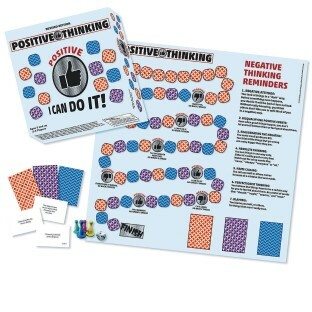 Clients learn the benefits of positive thinking! All players are winners if they have learned one thing about positive thinking! This exceptional therapeutic game maintains the premise that thought is the source of many of our emotional states. By becoming more aware of our self-talk and cognitive responses to situations, we can better select and control our emotions. Helpful in addressing emotional difficulties such as anxiety, depression, anger, and low self-esteem. All players are winners if they have learned even one thing about the benefits of positive thinking. Includes: game board, red, purple and blue cards, die, 100 chips, 6 pawn, and instructions. For 2-6 players.